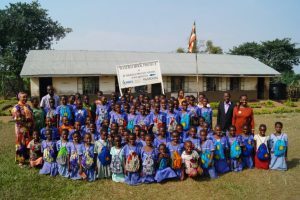 Zonta Kampala in Uganda and Zonta Aan de Leede in the Netherlands have joined forces so that girls can finish their schooling – preventing unwanted teenage pregnancy and helping to disrupt the cycle of poverty for women and their offspring in Uganda. Girls dropping out of school after they start to menstruate is an important problem in Uganda and other parts of Africa. Lack of education leads to an increased risk of (unwanted) teenage pregnancy, health problems and the perpetuation of the cycle of poverty and disadvantage. In addition, a lack of professional midwives to handle (pre-) pregnancy and labor problems leads to high maternal mortality. 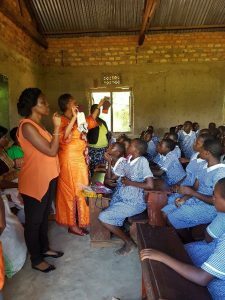 In 2015, Zonta clubs Aan de Leede and Kampala first joined forces to tackle risk factors such as the absence of safe latrines with a washbasin and sanitary pads. Cultural taboos concerning menstruation and lack of knowledge about sexual and reproductive health issues were recognized, as was the need to invest in training professional nurses/ midwives. During skype contacts, the clubs agreed on a project proposal with a budget and shared tasks. The expertise and knowledge base of the Zonta Kampala members was of pivotal importance to the success of the project. Their drive to help young girls succeed in finishing their schooling and their insight into the culture and needs of their country, led them to select, in consultation with the regional education authorities, schools most in need of help. Young women unable to finance midwife training themselves, were selected for training and coached. The Zontians compared bids, found reliable contractors, made site visits and audited the whole process. The Dutch club in the meanwhile, started to fundraise. Coordination between the two clubs and with other donors was done by the POWER Foundation, an NGO under Dutch Law, instituted by Aan de Leede Zonta members. In 2016 the club managed to raise €5000.- for prevention of school dropout and €2000.- for midwife training. POWER succeeded in obtaining an additional funding of €2500 by the Dutch NGO Wild Geese and an orientation trip by four members of Kampala to the Kanungu district in April 2017 was initiated. The Zonta project was introduced to the school management teams and the district government leadership as part of a transparency agenda. The report of the findings was shared, as well as the final report at the end of the project. In 2017 the Keep Girls in School project was implemented. At Kihihi primary school a latrine was built with 4 stacks, one being set apart for handicapped access, and a changing room for the girls to comfortably change their sanitary pads without fear of exposure. The latrine also has a water tank and a faucet so that the girls are able to wash their hands. Packages with reusable sanitary pads produced locally, a plastic bag to keep the used pads, a carrier bag, a user guide, underwear (as some girls were without) and a piece of soap were handed over as a kit to 131 girls from Kihihi primary school and 137 girls from Bushere primary school of the same district. An interactive training on menstrual, sexual and reproductive health and self-defense was provided by a professional trainer. The text was transcribed to the local dialect by a Zontian. After consulting the project partners, a surplus on account was used to provide an additional 200 girls from two other schools in the Kanungu district with the same sanitary materials and training. After a semester, funding was found for two midwife trainees. In 2018 an extension of the project was planned by the two clubs. Zonta aan de Leede raised € 5500.- for the sanitation & education part and €2000.- for the continuation of the midwife training program. The POWER Foundation was able to acquire an additional € 5500.- from the Dutch NGO Wild Geese. In 2019 the Kampala club started the implementation of the second part of this shared enterprise. This year latrines will be built at two more schools in the Kanungu district, Bushere- and Kibimbiri primary school. Sanitary packages, interactive menstrual, sexual and reproductive health training will be provided. We hope the two sponsored girls will accomplish their nurse-midwife training and be able to contribute to the Zonta goals of keeping girls in school and guarding their health. We urge other Zonta clubs around the world to follow our example. Making use of each other’s expertise and knowledge within the Zonta community is a successful and inspiring way of realizing our Zonta goals.